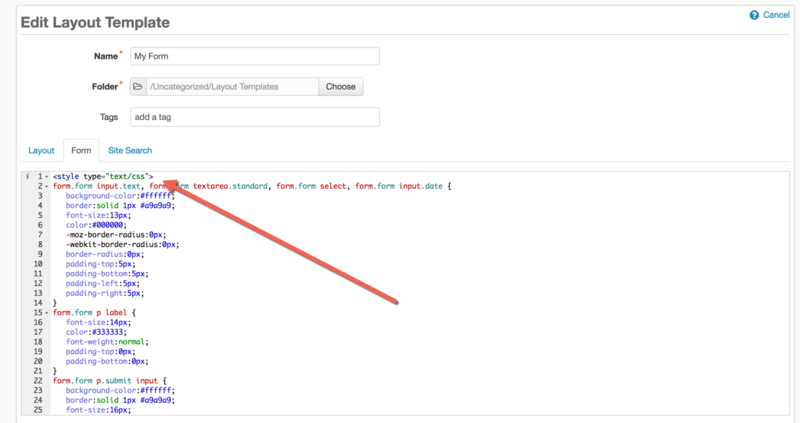 The form style generator will pull in the default styles. Customize the look of your form using the fields on the left side. A preview of your form will show on the right side. Copy the CSS that is generated and navigate to your Pardot form. Navigate to Marketing > Forms > Layout Templates and select the layout to add the form styles to. Paste the CSS right above the existing code of the Form tab and save. For us non code savy people, you may want to mention that the code you copy from here doesn't replace what already exists in the layout template. It goes right ABOVE the existing code. I know you mention it goes at the top, but maybe a screenshot that shows that the existing code is still there will be helpful. Nevermind, I placed it in the incorrect spot and then figured out where to put it after zooming in on my screen to see what you actually wrote.. Thanks again!!! Love this! Any possible way to make the button have a roll over? Has Pardot changed this feature? I don't see where to copy the CSS within the style generator. Thanks for the help!